When you choose a Polaris vehicle, you are choosing a long legacy of excellence and innovation backed by quality manufacturing. With a focus on power and stability without sacrificing on the fun, the Ranger is a perfect example of the level of manufacturing excellence you can expect from this respected name in the automotive world. When you need the latest in Polaris Ranger accessories, we have you covered with everything you could possibly need! 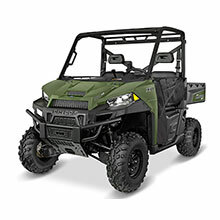 We offer one of the largest selections of Polaris Ranger accessories on the market. With a focus on bringing you only the best the industry has to offer, you will find a range of trusted names for these accessories to ensure a high standard of quality. We offer options for a wide range of years and model variations to ensure you get the right solution for the desired outcome. With options available for everything from the Ranger Crew to the Ranger XP, you are sure to find the right solution for your needs. You will also find that our inventory of Polaris Ranger accessories covers every imaginable aspect of the vehicle in terms of product type. For example, you will find a wide range of areas covered such as audio, heating, lighting, towing, and more. When looking to add some extra storage, we offer a range of essentials such as racks, gun totes, tool bags, and even coolers to add to the storing capability of your vehicle when you are on the go. If you are in need of covers to protect your vehicle from harm, we offer this solution in multiple options. For those looking to add some plowing power to their vehicle, we offer several plows and the necessary hardware to attach it in our selection of Polaris Ranger accessories. No matter what you are shopping for, we have you covered with our high-quality solutions. Add some fun and functional extras to your favorite vehicle today! We are committed to outstanding customer service. If you have any questions while shopping with us, please reach out for further assistance. We are glad to help!